Challah Board & Knife by Carl Poul Petersen, Montreal. Challah board and knife by Carl Poul Petersen, Montreal. The frame for the board is silver plate. The knife handle is sterling silver with a stainless steel blade. Both are clearly marked. 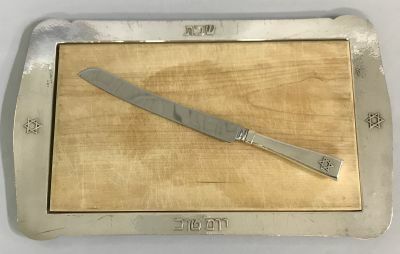 This is the first Petersen silver Challah board and knife we have had. The Challah board is 17 3/8” by 10 1/2”. The knife is 12 3/4” long.